While Fiat struggles in Europe, it has become more and more evident that it needs a third partner to become a real global player. Chrysler makes its part with awesome results in USA, but by the time the merge will be completed, both groups will need a third-party to conquer the next step: Asia. The presence of the group is still very small: 57.000 units were sold in China (+45%), and market share in India dropped from 1.1% in 2009 Q4 to 0.1% in 2012 Q4*. India and China are vital markets for the future of any independent car maker. In India, Fiat aims to double its market share by doing 3 mains things: opening more dealerships (up to 65 by March 2013) and increase the presence in mid-size and small cities; launching new models such as the coming locally built Abarth Punto or the imported Jeep Grand Cherokee and Wrangler; and finally, Fiat is working hard in terms of social events and marketing campaigns such as the ‘Coffee Festival’ in which the brand is promoted as part of public events. In China, the Viaggio is doing its work but it is expected the start of locally built Jeeps to increase the good demand these SUVs have already. At the end all this work will serve to reduce the big gap there is between Fiat-Chrysler presence in Europe/NAFTA/South America and Asia. In the other side there is Suzuki. It is a strong player in Asia but is very weak in the Americas and Europe. Last year they announced they are leaving US market after some years of very low demand, and last week Suzuki Europe chief, Takanori Suzuki, said that the brand has been profitable in that market since 2008. These two facts must be analyzed carefully. First of all, leaving world’s second largest market is not a good move specially now when Americans are buying cars again. It only shows how bad the position of the brand is in terms of products, which is the main reason for its extinction over there. In Europe, the situation is also bad: no profits and a Hungarian factory working at 50% of its capacity (in 2008 they produced 300.000 vehicles compared to 155.000 units last year). Suzuki sold more than 154.000 units in Europe in 2012, down 13.4%, and half of the way of its 2016 target. 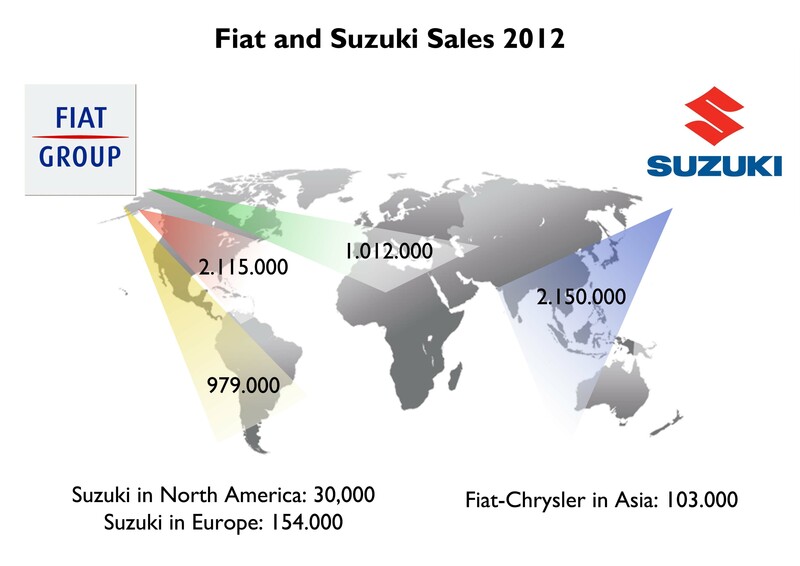 But, as it happens with Fiat-Chrysler, Suzuki’s results in the other side of the world are completely the opposite. They sold more than 670.000 units in Japan (+22%) and had a record year in India with more than 1 million cars sold (1.063.599), up 7%. The result in these 2 markets count for 87% of Fiat Group’s sales (without Chrysler). Both car makers know they need to produce more to survive as independent players. Both companies are good making small cars. Both of them need to balance their worldwide operations. And now, when Suzuki struggles to survive in Europe and closed in USA, isn’t the right moment to proceed? I’ve talked so many times about the advantages of a possible alliance with Suzuki (together they would produce around 6.3 million units, taking them to the second level of world’s largest auto makers). When two companies complement each other like that, and at the same time they deal with similar problems and challenges, then is time to think of going deep in cooperation. Suzuki problems in Europe should become an opportunity for both groups: Fiat could get in charge of the production of its models for Europe, while Suzuki could boost Fiat operations in India. Of course, they must first solve their own problems (such as Suzuki’s lawsuit with VW, or Fiat-Chrysler merge process), but the difficulties they have now should be the start for making of an opportunity a reality in the coming years. Agreed that there is a lot of synergies to be achieved. Suzuki could be just the low cost brand that Sergio Marchionne is thinking about. However will the Japanese tolerate a European take-over is another matter. With Nissan Renault no one wanted Nissan. But with Suzuki…. I don’t know. And as you say that sticky VW matter is there. argt21 suzuki the next lowcost brand of fiat?Totally wrong! Just to remember the key product of suzuki..swift,g.Vitara,Jimny..suzuki is not a low cost brand! And fiat for the low cost product got brasilian models ready..
Ardit you are probably thinking of Suzuki from it’s tiny European presence. In Asia most of it’s cars are made in India. Read above. In India they sold over 1m and in EU just 154k. ALL the Indian Suzuki’s are low price. Here in Sri Lanka Suzuki IS a low cost brand already because of this. The Swift is made in India and is one of the cheapest B segment cars around. They have quite a range of small cars like the Alto, Wagon R, Zen etc. Some Indian made RHD ones are already exported to the UK. Vitara and Jimny are almost non existent here as they are now ancient and re[placements have been very late. It makes perfect sense to me as Suzuki is well known and although cheap, has a very good reputation. 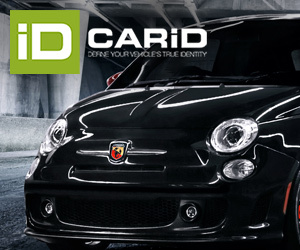 It would take Fiat a long time and a lot more resources to build its own low cost brand from scratch. Yes,i was considering the european position of suzuki after what suzuki said. If fiat is going to be premium in asia would be very nice to follow the situation. They could have a lot of savings by sharing A, B and C platform. It would be a winning deal! The trouble with the platform-sharing is that the Fiat platforms are too expensive for India and SE Asia, where Maruti Suzuki has the big volume. Between Fiat and Japanese-market Suzuki it could work well, though. But realistically anything like that has to work until Suzuki works out its dispute with Volkswagen. They are strong in complementary global markets and could share the same platforms and engines. As long as VW has owner interests in Suzuki, Fiat should have as little as possible to do with Suzuki. I cant see why Suzuki would want to help FIAT in India. Suzuki could gain from Fiat engines and small car platforms, while Fiat could gain from Suzuki’s dominant position. Then Suzuki could also have access to Brazilian car market and improve its presence in Europe.